By its strategic position at the interface between blood and tissues, endothelial cells control blood fluidity and continued tissue perfusion while simultaneously they direct inflammatory cells to areas in need of defense or repair. The endothelial response depends on specific tissue needs and adapts to local stresses. Endothelial cells counteract coagulation by providing tissue factor and thrombin inhibitors and receptors for protein C activation. The receptor PAR-1 is differentially activated by thrombin and the activated protein C/EPCR complex, resulting in antithrombotic and anti-inflammatory effects. Thrombin and vasoactive agents release von Willebrand factor as ultra-large platelet-binding multimers, which are cleaved by ADAMTS13. Platelets can also facilitate leukocyte-endothelium interaction. Platelet activation is prevented by nitric oxide, prostacyclin, and exonucleotidases. Thrombin-cleaved ADAMTS18 induces disintegration of platelet aggregates while tissue-type plasminogen activator initiates fibrinolysis. Fibrin and products of platelets and inflammatory cells modulate the angiogenic response of endothelial cells and contribute to tissue repair. The maintenance of blood fluidity is controlled by the inner lining of the circulatory system, a thin layer of cells, the endothelium. Endothelial cells cover the entire vasculature of vertebrates, and thus, form a hemocapatible blood container with a large surface, which has been estimated to amount 3,000–6,000 m2 . Although on many places not more than 0.2 μm thick, endothelial cells form a diffuse tissue of about 720 g in an adult person. Most of these cells are microvascular endothelial cells, and over 600 g of them cover the surface of capillaries . In the capillaries, exchange of nutrients and hormones occurs facilitated by the exposure of a large endothelial surface area to a relatively small volume of blood. In contrast, in arteries and veins the ratio between surface and blood volume is 100- to 500-fold less. Furthermore, the shear forces evoked by the flowing blood vary in different types of blood vessels. Consequently, considerable variation exists in the regulation of general and specific functions between arteries, veins, arterioles, postcapillary venules, and capillaries. In addition, specific tissue demands also underlie a large variation between microvascular endothelial cells from various tissues . This review focuses on the role of the endothelium in the regulation of hemostasis and thrombosis, and how an activated status of the endothelium, in particular induced by inflammation, can cause proper and improper adaptations of the endothelial phenotype. In relation to their role as a gatekeeper between blood and tissues, endothelial cells are equipped with several general main functions while in addition many specific functions are attributed to their specific location and tissue. Living endothelial cells are required to prevent thrombus formation. Specific functions and adaptations of endothelial cells aim at maintaining blood fluidity and preventing thrombus formation. This is only possible because the endothelium also actively controls the extravasation of fluid, solutes, hormones, and macromolecules , as well as that of platelets and blood cells. This guarantees the availability of appropriate amounts of clotting factors and platelets. Furthermore, the endothelium, together with the smooth muscle cells, plays an important role in the control of perfusion of specific tissues and the blood tension by local vasoregulation. This is further facilitated by the responsiveness of endothelial cells to vasoactive agents, and—in particular in the lung—by involvement of the endothelium in the conversion and catabolism of vasoactive agents. Another general feature of endothelial cells is that they can become activated by inflammatory cytokines, triggers of the innate and acquired immune response, and by other stresses such as hypoxia and metabolic stress [5, 6, 7, 8]. Such activations induce the transcription of new genes, which enable endothelial cells to offer a new repertoire of activities and receptors. Endothelial cells control the recruitment of leukocytes in areas, where these inflammatory cells are needed, in particular by expressing specific proteins cell adhesion molecules. They adapt their metabolism according to oxygen tension and metabolic needs. In inflammation, various functions of the endothelium are pivotal and well recognized from features such as tissue swelling due to a reduced barrier function, vasodilation, which also causes the red color, increased leukocyte infiltration, and alterations in the control of coagulation and thrombus formation into a more procoagulant direction. Furthermore, endothelial cells are involved in the healing process after wounding or inflammation by being the vector of angiogenesis, the formation of new blood vessels, which is essential for proper formation of granulation tissue and tissue repair as well as for re-canalization of mural and obstructing fibrin clots. Related to differences in shear forces by the flowing blood, blood oxygenation, and smooth muscle content, arteries and veins display marked differences in their response to vasoactive agents and inflammatory cytokines. While the regulation of vasodilation is fast in arteries, it is considerably slower in veins. Arterial shear forces induce the transcription factor KLF2 and suppress inflammatory activation, a property that is lost in atherosclerosis-prone areas with disturbed blood flow [9, 10, 11]. The different shear forces also bear impact on the nature of thrombi, which are platelet-rich (white) in the arterial tree, while more fibrinous and red in veins. Veins also contain valves, in particular in the lower limbs, which often become initiation sites for a venous thrombus, because of disturbed flow, local hypoxia, or other unknown reasons. The high availability of the fibrinolysis regulator tissue-type plasminogen activator (t-PA) may contribute the fact that these thrombi make little contact to the endothelium while extending and growing in the bloodstream, by which they become prone to form large emboli. A comparison of endothelial cells cultured from arteries, veins, and microvessels from various tissues demonstrated that not only arteries and veins displayed distinct differences but in particular, microvascular endothelial cells had specific genomic properties with additional differences at the tissue level . This is reflected in different expression of surface receptors, such as the microvascular-specific expression of α1β1-integrins  and plasmalemma vesicle-associated protein-1, a leukocyte trafficking molecule recognized by the antibody Pal-E . Tissue-specific endothelial expression of γ-glutamyl-transpeptidase and monoamine oxidase was observed in brain microvessels. Bone marrow endothelial cells express E-selectin constitutively, while in other types of endothelium E-selectin synthesis requires inflammatory activation. The lymphocyte receptor MadCam is found in endothelium of lymph nodes and Peyer’s patches vessels of the intestine . Fenestrae and heparin receptors are found in liver sinusoids. Thrombomodulin, while abundantly present in other endothelial cells, is poorly expressed or absent in brain microvascular and liver sinusoidal endothelial cells . Differences between microvascular endothelial cells in heart, kidney, and lungs were recently reviewed by Aird . In addition, the response to inflammatory cytokines and vasoactive agents differs between various vascular beds, among which the postcapillary venules often respond most pronounced. Similarly, the microvascular endothelium of different tissues responds differently in this respect, thus explaining tissue-specific pathological responses, such in Shiga toxin induced hemolytic uremic syndrome, where the Shiga toxin receptor Gb3 is increased by tumor necrosis factor alpha (TNF-α) specifically in kidney glomerular endothelial cells making them prone to damage . Endothelial cells respond and adapt their phenotype at various time intervals according to the nature of the stimulus [5, 19]. These responses comprise acute release of endothelial products; immediate response to hypoxia by activation of hypoxia-inducible factors HIF-1 and HIF-2 and subsequent induction of new genes; induction of new endothelial receptors and secreted proteins by inflammatory cytokines, endotoxin, activation of toll-like receptors, and CD40 ligand; shedding of surface receptors following these reactions; and participation in immunological reactions. The endothelial cells are able to respond within minutes to vasoactive agents, thrombin, or TNF-α. This acute response follows receptor-mediated cell signaling accompanied by influx of calcium ions and induction of various types of phosphorylations, which result on the one hand in activation of enzymes that generate NO, prostacyclin/prostaglandin E2 and, in certain conditions endothelin-1, and on the other hand in the recruitment of vesicles with pre-formed proteins to the plasma membrane. The Weibel–Palade bodies are specific representatives of these storage organelles and release von Willebrand factor (VWF), P-selectin, and angiopoietin-2, which are involved in platelet binding, leukocyte recruitment, and inflammation modulation, respectively. But also the content of other vesicles containing the fibrinolysis regulator t-PA or the vasoconstrictor endothelin-1 can become released simultaneously depending on the vessel type. Acute release of endothelial products by thrombin is largely mediated via the protease-activated receptor-1 (PAR-1). It should be noted that earlier exposure to low thrombin concentrations causes activation of protein C, which modifies the response of PAR-1 (see below). Furthermore, activation by vasoactive agents cause a several minutes during transient impairment of endothelial barrier function in postcapillary venules. When endothelial cells become hypoxic, they respond immediately by rescue of hypoxia-inducible factors HIF-1α and HIF-2α (Fig. 1, lower part). These factors are continuously synthesized and degraded in the proteasomes after modification by prolyl and asparagyl hydroxylations and interaction with von Hippel–Lindau protein [6, 20]. Because the HIF prolyl hydoxylases require oxygen for their activity, the absence of sufficient oxygen results in the rescue and nuclear translocation of the HIF-α-subunits. Subsequent dimerization with HIF-1β/ARNT results in either HIF-1 or HIF-2 that act via specific responsive elements as transcription factors for many, probably 600–1,800 genes. They comprise genes involved in metabolism, cell survival, angiogenesis, matrix deposition, and recruitment of leukocytes and progenitor cells, such as SDF-1 and CXCR4 . While HIF-1α is ubiquitously present in cells, the synthesis of HIF-2α is restricted to a limited number of cell types and prominent in endothelial cells. Besides HIF activation, the cellular protein synthesis machinery is switched to a more energy-saving program, which also can include the use of intra-ribosomal entry sites for translation of shorter proteins. Whether hypoxia also affects the regulation of hemostasis is not sufficiently known; neither how hypoxia and inflammation cooperate in the endothelial regulation of hemostasis. While hypoxia can be accompanied by inflammatory activation, it remains to be established whether this is due to a direct effect in endothelial cells, or whether activation of hypoxic monocytes results in a subsequent inflammatory response. Alternative mechanisms including unfolded protein stress may also be involved . Many studies and reviews have reported on the activation of endothelial cells by endotoxin and inflammatory cytokines TNF-α and IL-1. These mediators activate endothelial cells via receptors that activate the classical NFκB pathway (Fig. 1, upper part). This pathway involves a complex consisting of NEMO (NFκB essential modulator) with the heterodimer IκB kinase-α/β (IKKα/IKKβ), which causes phophorylation-induced detachment and proteasomal degradation of the inhibitor IκBα, -β and -ε . Displacement of IκB liberates the p65/p50 complex called NFκB for translocation to the nucleus. Other combinations of p65 (Rel A) and C-rel on the one hand with p50 and p52, which are derived from p105 and p100 NFκB precursor proteins, can also form NFκB. A similar NFκB activation occurs by toll-like receptors, in particular TLR-2 and TLR-4 in endothelial cells, which are domain recognition receptors of the innate immune system. Their primary role is to recognize common domains in bacteria and viruses, but they also recognize denatured and oxidized proteins. The presence of TLR4 was shown on various endothelial cell types and becomes significantly increased under inflammatory conditions . TLR2 is also markedly enhanced by inflammation and, e.g. is present on endothelial cells of atherosclerotic lesions . Other mediators, such as CD40 ligand and lymphotoxin may activate the classical NFκB pathway, but stimulate in particular a non-canonical NFκB pathway. After receptor activation this pathway includes degradation of the protein TRAF3 and subsequent NIK- (NFκB inducing kinase)-mediated dimerization of IκK, NFκB precursor protein p100 degradation with release of p52, which complexes with RelB and activates in the nucleus specific NFκB transcription activation sites . The classical NFκB induces a range of new genes required for the inflammatory response, such as leukocyte adhesion molecules E-selectin, VCAM-1 and ICAM-1, cyclooxygenase-2, and in endothelial cells in vitro tissue factor, plasminogen activator inhibitor-1, and urokinase-type plasminogen activator. The availability of NO can counteract this inflammatory activation in part . As arterial laminar flow enhances eNOS synthesis and activity, part of its anti-atherogenic effect regards limiting inflammatory activation of the endothelium [10, 27]. The non-canonical NFκB pathway can enforce the inflammatory activation by the classical NFκB pathway or can modulate it. Finally it should be mentioned that activation of the TNF-receptor-1 by TNF-α not only activates NFκB signaling but is also linked via riboflavin kinase to the activation of NADPH oxidase , which may cause immediate generation of superoxide and cell activation. Activation or release of surface-bound proteases, such as the so-called ADAMTS metalloproteinases, can cause shedding of proteins from the endothelial surface. Shedding of EPCR and thrombomodulin reduce their availability for protein C activation [29, 30]. Microparticles with clusters of endothelial receptors can also be shed from the endothelial cell . The glycocalyx that contains binding sites for antithrombin III and other important proteins is markedly reduced on the microvascular endothelium of diabetes patients  and can be proteolytically affected by heparanase from platelets . The shedded proteins can sometimes harbor new functions. For example, while endothelial cells lack the IL-6 receptor, soluble IL-6 receptor shedded from other cells in severe sepsis can bind to gp130 on endothelial cells and thus induces IL-6 mediated signaling into endothelial cells, which affects leukocyte extravasation . Shedded soluble thrombomodulin was shown to protect ischemic kidneys . Finally, endothelial cells can participate in immune reactions and acquire high venule endothelial phenotype e.g. in rheumatoid synovium or in vitro after exposure to interferon-γ [5, 36]. Studies on endothelial cells in vitro can be helpful to challenge specific questions regarding factors or mechanisms that are anticipated on the basis of observations in vivo. The findings must be verified and challenged by the in vivo complexity. In addition to information that became available from careful analysis of the background of patients with genetic defects suffering from thrombotic or bleeding disease, many studies regarding the functioning of endothelial cells in hemostasis have originated from the concept that endothelial injury/dysfunction is an early event in the development of the atherosclerotic plaque and accompanying studies on the prevention and removal of arterial thrombi. Factors that precipitate atherosclerosis may indeed interfere with the endothelial defense system that actively counteracts the development of thrombi. However, as pointed out elegantly by Aird , the vascular bed has different properties and hemostasis requirements at various sites and in different tissues. Therefore, it is important to obtain information at specific sites, such as in blood brain barrier microvessels which do not express thrombomodulin, in vascular pockets along vein valves that may experience stasis and hypoxia, and around glomerular endothelial cells with their specific fluid dynamics and interaction with podocytes. The recent availability of mice models in which the consequences of vascular damage can be studied in real-time in vivo by dual photon microscopy , in combination with transgenic models overexpressing or deficient of specific factors, provides a powerful tool that adds to the existing knowledge obtained from patients with genetic defects in coagulation or platelet factors and specific conditions which are prone to thrombosis. Table 1 summarizes the main features of hemostasis control by the endothelium. Endothelial cells act by promoting anti-coagulant properties and counteracting platelet activation and aggregation. However, if activated by vasoactive agents, they release VWF that promotes binding of platelets and t-PA that enhances control by fibrinolysis. Furthermore, vasoconstriction is an important initial response when the vessel is damaged. It is caused by direct access of smooth muscle cells to locally generated vasoactive agents and by bypassing the vasodilatory action of endothelial cells. Impairment of these antithrombotic properties of the endothelium either by genetic or acquired deficiencies or by alteration of endothelial gene expression in severe inflammation can cause severe thrombotic complications. The next section shall discuss these aspects in more detail. In vivo coagulation requires the availability of the transmembrane protein tissue factor, the initiator of the extrinsic coagulation pathway. Tissue factor dependent signaling is required for embryo development but dispensible for hemostasis. Its extracellular domain binds and enhances the proteolytic activity of factor VII, which in turn activates factor X and factor IX by enzymatic cleavage. Activated factor X (Xa) subsequently activates prothrombin to thrombin, the protease that converts fibrinogen into fibrin. The additional activation of factor IX by factor VIIa is important, because factor Xa together with factor VIIa are bound to inhibitory Kunitz domains of the protein tissue factor pathway inhibitor (TFPI) and become rapidly inhibited together. TFPI is expressed particularly in microvascular endothelium where it is bound to its surface . However, it also acts on the arterial endothelium, as its deletion also causes increased ferric chloride-induced arterial thrombosis in mice . The simultaneously activated factor IXa can activate additional factor X molecules so that the coagulation pathway can still proceed when factor VIIa is inactivated. Tissue factor is present on tissue cells beyond the microcirculation and in the adventitia and plaques of conduit vessels. In inflammation and sepsis, it becomes strongly induced in monocytes-macrophages [42, 43]. Indeed, while vessel accompanying cells, such as fibroblasts, are the source of tissue factor in an acutely damaged vessel, monocytes are the prime source in inflammation and hypoxia. It is true that inflammatory cytokines rapidly induce tissue factor on cultured endothelial cells , but subsequent in vivo studies have been unable to detect its expression in vivo in similar conditions. Only in specific subsets of endothelial cells in severe sepsis and local flow disturbances in baboons and in human tumors the presence of tissue factor has been demonstrated on endothelial cells in vivo [42, 45, 46]. One study described the presence of tissue factor containing microvesicles in the basement membrane of endothelial cells of LPS-stimulated bovine aorta . However, although recent studies on circulating microparticles indicate the presence of tissue factor in platelet microparticles, its presence on in vivo circulating endothelial microparticles, in contrast to in vitro generated ones, is still uncertain [31, 48, 49]. As pointed out by Mackman , the presence of tissue factor on activated endothelium in vivo may be alternatively explained as being attributable to the deposition of monocyte-derived tissue factor-positive microparticles, similar as demonstrated for granulocytes . Recent studies on NY1DD sickle mouse, which exhibits a low-TF to high-TF phenotype switch on exposure to hypoxia/reoxygenation, suggested that the lack of NO availability can induce TF in endothelial cells in vivo . Similarly as factor VIIa needs the membrane-anchored tissue factor, the activation of prothombin by factors Xa and X activation by factor IXa require the cofactors Va and VIIIa, respectively (both activated by thrombin), and the availability of a negatively charged phospholipids surface. The latter is provided by platelets once they become activated by thrombin or by contact with the damaged vessel wall or tissue. Therefore, once the coagulation has started to produce thrombin, it becomes highly amplified. It is therefore important that the endothelial surface provides several proteins and receptors that inhibit thrombin and counteract the progress of coagulation. The potent thrombin inhibitor antithrombin III binds to specific heparan sulfates of proteoglycans in the glycocalyx that covers the endothelial surface . Inadequate antithrombin III activity is accompanied by severe thrombotic complications. Furthermore, a triad of endothelial receptors is involved in the generation the important anti-coagulant activated protein C (aPC), which can interrupt the coagulation cascade by cleavage of factors Va and VIIIa, and in mediating its cellular anti-inflammatory action. They comprise thrombomodulin, the endothelial protein C receptor (EPCR) and PAR-1, which displays an altered signaling when activated by the EPCR/aPC complex instead of thrombin. Thrombomodulin is synthesized predominantly—but not exclusively—by endothelial cells. It is ubiquitously expressed, except for the microvasculature of the brain where it is undetectable . Thrombomodulin transcription is enhanced in endothelial cells by arterial shear forces, which involves the transcription factor KLF-2 . It is reduced by inflammatory mediators, and can be rapidly decreased by proteolytic shedding. As a membrane protein is present at the surface of the endothelial lining, where it catalyzes the conversion of protein C into aPC by thrombin. This is facilitated by EPCR, which is abundantly present on endothelial cells. EPCR binds protein C with high affinity to the surface of endothelial cells adjacent to the thrombomodulin-thrombin complex, so that a relatively high local protein C concentration and effective aPC generation is achieved. aPC will split and inactivate the cofactors Va and VIIIa, in part in interaction with protein S, and thereby shut down continued coagulation. The importance of this pathway is underscored by the occurrence of thrombosis in patients, who display (partial) deficiencies in protein C or thrombomodulin and in carriers of a factor V variant that is poorly degraded by aPC, factor VLeiden. Mutations in thrombomodulin can also underlie the occurrence of hemolytic uremic syndrome in specific patients . Thrombomodulin is also involved in the activation of tissue-associated fibrinolysis inhibitor , which inactivates complement factor C5a . EPCR does not only bind protein C via its Gla-domain of protein C but also aPC with equally high affinity . At appropriate sites of the plasma membrane, namely in the lipid rafts, the EPCR-aPC couples to PAR-1 . At these sites, the complex also interacts specifically with caveolin at the inner side of the plasma membrane . In cultured endothelial cells 25–30% of PAR-1 is available for such interaction, the reminder remaining available for thrombin . However, aPC in the aPC/EPCR complex activates PAR-1 in a different way than thrombin possibly also involving differences in the interaction with caveolin. Instead of an activation of PAR-1 via G12/13 proteins, it activates much stronger a Gi protein, by which anti-inflammatory properties are activated in the endothelial cell, and probably also in hemopoietic cells. In the context of its anti-inflammatory properties, a number of studies focused on an improvement of the endothelial barrier function by aPC. In in vitro studies, activation of endothelial PAR-1 by interaction with the EPCR-aPC complex caused activation of Gi protein and MAPK phosphorylation with subsequent sphingosine-1-phosphate (S-1-P) generation and cross-activation of the S-1-P receptor-1 [62, 63, 64, 65]. This latter activation leads to activation of Rac-1 , which has endothelial barrier improving properties . Endogenous activated protein C may also limit cancer cell extravasation by a similar mechanism . Because infusion of aPC or S-1-P 2 h prior to endotoxin challenge reduced mortality in mice, this mechanism was considered to be active in endotoxinemic mice . However, while S-1-P is known as a barrier stabilizer, also in the absence of aPC , the data on aPC pre-infusion might also be interpreted differently. 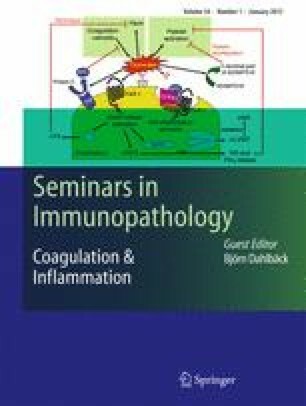 Several recent studies indicate that hemopoietic cells play a role in reducing mortality of endotoxinemia in animals rather than direct barrier protective properties by aPC/EPCR/PAR-1-mediated signaling in endothelial cells [69, 70]. Amelioration of colitis by aPC in mice involved a reduction of leukocyte adhesion , so that the effect may be even at both the hemopoietic and endothelial cell level. Endothelial NFκB activity plays a crucial role in multiple organ failure and tissue damage in sepsis . As activation of the endothelial NFκB pathway reduces thrombomodulin and EPCR expression and increases their shedding from the endothelial surface, probably by AMADTS-17 activity, such activation impairs the protein C anti-coagulant mechanism in endotoxinemia . However, activated protein C protects endothelial cells and limits its inflammatory activation by activation of both the non-canonical NFκB pathway and ERK1,2 activation [74, 75]. The anti-inflammatory activation of PAR-1 by aPC adds to the well known PAR-1 activation by thrombin, which in endothelial cells induces a number of cellular responses that counteract the thrombotic response that is initiated by thrombin (Fig. 2). Thrombin activation of PAR-1 induces several routes of intracellular signaling, by which (a) nitric oxide (NO) and prostacyclin production are enhanced, which cause vasodilation and limit platelet activation; (b) t-PA is released that binds to the fibrin generated and causes effective fibrinolysis; and (c) Weibel–Palade bodies are activated that release VWF, angiopoietin-2, and P-selectin, the latter two also enhancing a subsequent inflammatory response by PMNs. All these reaction occur within minutes. The precise extent of the various aspects of this response, also called acute response, can vary between different types of blood vessels and between tissues, as indicated above for NO, prostacyclin, and t-PA. The number of Weibel–Palade bodies also can vary between different types of vessels. VWF is the major protein of the Weibel–Palade body and its multimers cause a striped structure when visualized in the electron microscope . VWF is only synthesized in endothelium and megakaryocytes and present in α-granules of platelets. After synthesis in the endothelial endoplasmic reticulum, VWF is processed in the Golgi complex. By the lower pH in the terminal Golgi complex, VWF molecules form back to back dimers, which subsequently become spontaneously packed as multimers in a spiral-like fashion . In this way, the specific Weibel–Palade body is formed, which remains the storage organelle for VWF until its release into the blood. Basal secretion of VWF proceeds via the same route . Besides VWF, P-selectin and angiopoietin-2 are deposited in and released from the Weibel–Palade bodies [79, 80]. Furthermore, several other proteins can be encountered in the Weibel–Palade bodies, such as t-PA and IL-8, but only a small fraction of these proteins is stored in this specific organelle. VWF can be released from the endothelial cells by vasoactive agents, such as histamine, bradykinin, and vasopressin, and thrombin, which enhance cytoplasmic calcium concentration and activate protein kinase C. During this release process, that occurs within 5–10 min single and clusters of Weibel–Palade bodies fuse with the plasma membrane and release VWF [81, 82]. If the endothelial cells are stimulated by cAMP-elevating agents, only a part of the Weibel–Palade bodies is released that contain VWF, but little P-selectin . Probably by the exposure to the neutral pH of the blood, VWF is unfolding and so-called ultra-large VWF multimers (ULVWF) are formed on the surface of the endothelium, which can amount up to several mm in length, when formed by combination of the VWF content of several Weibel–Palade bodies. These ULVWF multimers align along the surface of the endothelium or damaged vessel, and are able to bind platelets directly by interaction of their VWF-A1 domains with platelet GpIbα moieties. Under high shear forces, platelet GpIIb can bind to VWF-A3 domains. On the surface of the endothelium, these ULVWF multimers are cut in smaller multimers by the action of the metalloproteinase ADAMTS13, which stands for a disintegrin-like and metalloprotease with thrombospondin type 1 repeats-13 . ADAMTS-13 binds to the VWF-A3 domain and cuts individual VWF molecules at a specific site (Tyr1605-Met1606) within the VWF-A2 domain. This proteolytic activity, which is facilitated by ADAMTS13 binding to the endothelial surface, results within minutes in the generation of shorter VWF multimers and a conversion of the extended strings of ULVWF into smaller more globular VWF multimers of less than 20 μm. Hence, VWF multimers with variable length become circulating in plasma but once detached into the circulation the binding and cleavage sites for ADAMTS13 on the A2-A3 domains of VWF multimers or platelet-VWF complexes is buried in its round-up structure and becomes only available again under high fluid shear forces . ADAMTS13 is synthesized in liver stellate cells, endothelial cells, and present in platelets. Furthermore, it is synthesized in kidney podocytes and deposited in the glomerular basement membrane, where it may have a specific function in preventing thrombus formation. Given the overall mass of endothelial cells in the body, one may anticipate that endothelial cells have a considerable if not major contribution to the production of ADAMTS13 in the blood. ADAMTS13 is also active when it still contains its propeptide, and performs activity when appropriately bound to VWF . ADAMTS13 bound to endothelial cells exhibited enhanced cleavage of VWF. This binding involves the C-terminal thrombospondin domain ADAMTS13 and occurred independently of VWF . Davis et al. suggested that CD36 is a good candidate for this binding. These data may underlie the observations that trombospondin-1—by competition—protects VWF from cleavage by ADAMTS13  and may bear impact on the observation that CD36 antibodies were found in patients with hemolytic uremic syndrome . In addition to deficiency of ADAMTS13 activity by mutation or generation of auto-antibodies, a partial reduction of ADAMTS-13 activity due to reduced synthesis has been reported in severe inflammatory conditions, although the extent of this reduction varies between different studies [91, 92]. A suppressive effect of inflammatory mediators is underscored by the findings that endotoxin infusion in healthy human volunteers caused a 36% decrease of ADAMTS13, in addition to an increase in VWF  and by a short report showing that ADAMTS13 mRNA and proteolytic activity was reduced by interferon-γ, TNF-α and interleukin-4 in rat primary hepatic stellate cells and human endothelial cells in vitro . Animal studies may provide additional information. ADAMTS13 deficiency in mice results in a prothrombotic phenotype and VWF platelet strings in histamine-stimulated mesenteric veins but not in arterioles . In addition, it also slows down leukocyte rolling in these vessels, and increased influx of PMNs in thioglycolate-induced peritonitis and into skin tissue in excision wounds . Shiga toxin triggers TTP in a subset of ADAMTS13-deficient mice, but this response required an additional triggering event . The smaller Shiga toxin B subunits, rather than the usually active A-subunit, induce VWF secretion and thrombotic microangiopathy in ADAMTS-deficient mice . On the other hand, ADAMTS13 inhibition in baboons was sufficient to cause TTP in the absence of inciting triggers . Platelets are normally repelled from the surface of the endothelium by the negatively charged glycosaminoglycans, but this defense can be overcome in activated platelets by receptor-ligand interactions, namely the binding of P-selectin to the protein PSGL-1 that bears P-selectin sugar ligands, binding of GpIbα to either P-selectin or VWF on the surface of the endothelium, and indirectly via a fibrin bridge that joins GpIIb/IIIa and ICAM-1. Platelet heparanase, which is released from activated platelets, can facilitate this interaction by degrading proteoglycans in the endothelial glycocalyx. Endothelial cells actively prevent or limit thrombus formation by suppressing platelet adhesion and activation . The surface of endothelial cells harbors ectonucleotidases (CD39), which rapidly convert the platelet-stimulating ADP into adenosine . Platelet activation is counteracted by prostacyclin and prostaglandin E2, which are liberated from the endothelium after stimulation by vasoactive agents and thrombin. Prostacyclin is produced by the endothelium of large vessels, while the endothelial cells from smaller vessels produce predominantly prostaglandin E2 . The effect of prostacyclin is enhanced by nitric oxide, which is produced by endothelial nitric oxide synthase (eNOS). Nitric oxide production is rapidly enhanced after exposure of endothelial cells to vasoactive agents that enhance the cytosolic calcium ion concentration, and by exposure of the endothelium to arterial shear forces, which induce eNOS synthesis and enhance its activity by phosphorylation of Ser 1177 (Ser1179 in mouse) [102, 103]. The importance of NO as antithrombotic mediator was also demonstrated in a recent study on the prothrombotic effect of antiphospholipid antibodies in mice . The antiphospholipid syndrome is accompanied by recurrent thrombosis. Ramesh et al. showed that interaction of the complex between a dimer of β2-glycoprotein-1 and antiphospholipid antibody interacts with the LDL-binding domain of the so-called apoER2 lipoprotein receptor by which the protein phosphatase PP2A was activated and eNOS was dephosphorylated at its Ser1179 site. This reduced NO production markedly and resulted in increased leukocyte adhesion to endothelial cells and increased tendency to thrombus formation. It should be noted that nitric oxide, prostacyclin, prostaglandin E2, and adenosine also induce vasodilatation. While vasoconstriction is a first response of a damaged vessel to limit blood loss, rapid vasodilation can help to limit the area of ischemia once an initial thrombus has been formed in the arterial leg of the circulation. By immediate vasodilatation, a new thrombus may move to a more distal part of the vascular tree, so that it will cause ischemia in a smaller area, in particular if such a thrombus passes across a branch point of the distal vessel. The previous mechanisms all aim at preventing platelet activation and aggregation. Interestingly, a recent study pointed to an additional mechanism in thrombin-activated endothelial cells that is aimed at disintegrating platelet aggregates that have already been formed . Thrombin not only enhances the secretion of ADAMTS18, but also uncovers by proteolytical cleavage a new activity in the obtained 45 kD C-terminal part of ADAMTS18. The C-terminal ADAMTS18 fragment that is generated contains a newly exposed 18mer moiety that binds to platelet GPIIIa49-66. By this interaction, platelet aggregates become destroyed by oxidative platelet fragmentation. This was not only observed in vitro, but the ADAMTS18 fragment also limited FeCl3-induced carotid artery thrombosis in mice as well as cerebral infarction in a murine postischemic stroke model in vivo . Endothelial cells also provide a mechanism that counteracts the accumulation fibrin, the product of coagulation. To that end, endothelial cells produce t-PA, the prime regulatory component for activating the fibrinolytic system in blood and body cavities . Both single-chain and double-chain t-PA activate the liver-derived zymogen plasminogen into plasmin, but t-PA requires binding to fibrin before it obtains activity. The broadly acting protease plasmin subsequently degrades fibrin into fibrin degradation products. Endothelial cells produce and release continuously t-PA, which is cleared within 10–15 min by the liver, unless it has encountered fibrin to which it binds. In this way t-PA monitors the patency of blood vessels and removes via fibrinolysis hidden deposition of fibrin in the vessels. Furthermore, t-PA becomes acutely released from storage organelles after exposure of endothelial cells to vasoactive agents or thrombin. The high availability of t-PA at the moment that a fibrin network is forming ensures the binding of t-PA within the clot, by which it is much more effective in fibrinolysis than when t-PA is added from the outside to an existing clot. There exists some dispute about the nature of the storage vesicles for t-PA [107, 108]. Although t-PA has been encountered in Weibel–Palade bodies, it is generally believed that this represents only a minor fraction of t-PA in the endothelial cells. After carefully establishing the conditions for inducing adequate acute release of t-PA in endothelial cells, Emeis et al. demonstrated that t-PA was present in specific vesicles, that were separate of the VWF containing Weibel–Palade bodies and other endothelin-containing vesicles. These “Emeisosomes” are probably involved in both basal and induced release of t-PA. In the absences of plasminogen MT1-MMP also can act as a fibrinolysin . Furthermore, endothelial can synthesize a second plasminogen activator, urokinase-type (u-PA), when they are activated by inflammatory cytokines, such as TNF-α, IL-1, endotoxin, or lymphotoxin . Its activity is confined to the cell surface by the urokinase receptor (UPAR) . It is generally believed that MT1-MMP and u-PA play important roles in pericellular proteolysis during cell migration, matrix invasion, and angiogenesis [112, 113, 114]. u-PA bound to UPAR is also involved in leukocyte and progenitor cell migration invasion, which may underlie the observation that selective abrogation of the u-PA/UPAR interaction plays a pivotal role in the suppression of chronic inflammation to exacerbated fibrin deposition . Both the activity of t-PA and u-PA are inhibited by plasminogen activator-1 (PAI-1). PAI-1 is produced in large amounts by cytokine-stimulated cultured endothelial cells, but the contribution of endothelial PAI-1 in vivo has been debated. Platelets contain PAI-1, and liver and adipose tissue cells respond to cytokines TNF-α and TGF-β by enhanced production of PAI-1 [44, 116, 117]. PAI-1 can also interact with aPC [118, 119], but the physiological meaning of this interaction is less clear. Interestingly, PAI-1 is secreted as an active molecule but rapidly loses its activity, probably by exposure to the more oxidative environment which induces a structural change. When PAI-1 interacts with u-PA, the complex is cleared by UPAR. In this way, the large availability of PAI-1 and UPAR can reduce the u-PA concentration in the environment of the cell. The haemostatic plug not only acts as a sealing of the tissue after wounding, but also as the scaffolding for invading cells during the subsequent healing process. Thrombin can also be considered as a growth factor and can stimulate angiogenesis and vascular remodeling. Activated protein C has anti-apoptotic properties for endothelial cells. The transient fibrin matrix is an excellent matrix for endothelial cells to act as scaffolding for new capillary structures [120, 121]. The presence of a fibrinous exudate can facilitate the angiogenesis process by providing factors and matrix for the invasion and expansion of new microvessels. Angiogenesis is induced by angiogenic growth factors often in combination with inflammatory mediators or other factors induced by ischemia or secreted by platelets. Furthermore, several fibrin degradation products can activate or protect the endothelium [122, 123, 124, 125]. In addition to their pivotal role in the formation of the hemostatic plug, platelets facilitate tissue repair and inflammation. Platelets are a rich source of factors that stimulate tissue repair and facilitate interaction between leukocytes and endothelial cells. They accumulate and release, after activation, many vasoactive agents and chemokines, such as serotonin, thromboxane A2, platelet activating factor and RANTES, and angiogenic growth factors, in particular VEGF, that is secreted in a potent fibronectin-bound form . These factors are stored in α-granules and released upon activation of the platelet . Interestingly, angiogenesis inhibiting proteins, such as thrombospondin-1 and endostatin, are stored in separate granules in the same platelet . Thus, platelets are potentially powerful regulators of tissue repair associated angiogenesis. After stimulation, platelets also release P-selectin from a specific area in the α-granules which then becomes expressed on their surface. P-selectin plays an important role in the recruitment of platelets on neutrophils and monocytes and in their interaction with endothelial cells [128, 129]. Finally, activated platelets also produce and expose CD40 ligand (CD40L or CD154), which can interact with leukocytes or activate the non-canonical NFκB pathway in endothelial cells and thus enhance the expression of leukocyte receptors and enhance the production of chemokines MCP-1 and interleukin-8 . In this way, platelet play important roles in inflammation and sepsis, as well as in immunoregulation, such as occurs in the atherosclerotic plaque [129, 130]. By its strategic position at the interface between blood and tissues, the endothelium controls blood fluidity and continued tissue perfusion while at the same time it directs recruitment of inflammatory cells to areas that need defense or repair. From the foregoing discussion, it becomes clear that endothelial cells at different sites in the body achieve a delicate fine tuning, by which coagulation, thrombus formation, and inflammation are kept in balance and adapted to the local needs. Notwithstanding, these balances can become disturbed in by genetic, immunologically acquired deficiencies and by overreactions to microbes and toxins. Better understanding of the underlying mechanisms that contribute to thrombotic and inflammatory disease will be the basis for further development of effective treatments to combat these complications. At the same time, it is fascinating how delicately the interaction between hemostasis and inflammation is regulated by the endothelium. The authors would like to thank Hans de Zeeuw and Isabelle Vergroesen for their help in preparing the manuscript. VvH was supported by the Netherlands Initiative for Regenerative Medicine.